Reading and share top 1 famous quotes and sayings about Impartation by famous authors and people. Browse top 1 famous quotes and sayings about Impartation by most favorite authors. 1. "Don't pray that God would teach you how to love like He loves; pray that He would fill you with Himself and that He would love in and through you. Don't pray that He would teach you to have joy; pray that the living God full of joy would enter into you. 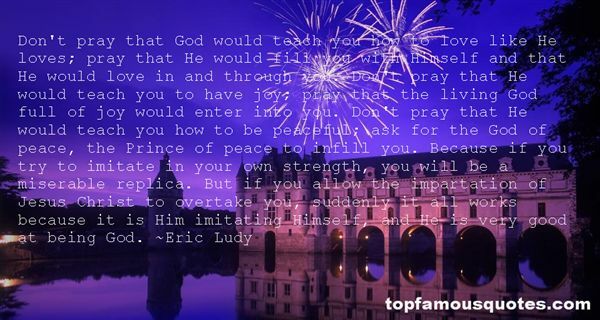 Don't pray that He would teach you how to be peaceful; ask for the God of peace, the Prince of peace to infill you. Because if you try to imitate in your own strength, you will be a miserable replica. But if you allow the impartation of Jesus Christ to overtake you, suddenly it all works because it is Him imitating Himself, and He is very good at being God."